Honey bees are organized and focused— "done right" by their Creator who programmed them with not-by-accident equipment suitable for each assignment. For example, the worker bees who act as "queen-makers" select several larvae with "queen potential" to feed a special, not by accident, royal jelly diet. It's a diet the queen enjoys her entire life! (All bees—whether drones, workers or queen bees—are fed royal jelly their first 21/2 days.) 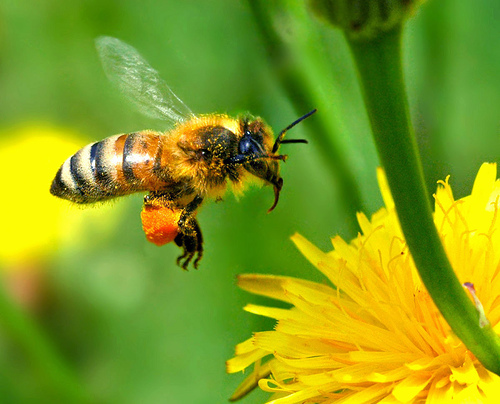 Not by accident their Designer gave the worker bees special glands on the underside of their abdomens where they produce that royal jelly full of protein and vitamins B, C and D to ensure the health of all the bees at the start of their lives. That continuous royal jelly nourishment prepares the specially selected larvae to be the next queen! There's only one queen bee per hive, and her job is to produce babies! So, during the two to eight years of her life, she can actually produce up to 1,500 eggs daily! Drones number just a few hundred in a hive. Their only job is to mate once with the queen. Their eyes are slightly larger than that of the other bees—so they can more easily find the queen! The thousands of faithful little non-fertile worker girl honeybees were also given other not-by-accident under-belly glands that produce the beeswax that they then shape with their mouths into the six-sided cells that are real masterpieces of precise engineering when the hive is built. When young workers are serving as "home bees", among other chores they can be found providing what I call "Honeybee AC!" Now that brings us to what the older worker bees do after they graduate from being "home bees". They begin practicing how to use their wings, and learn the special dance of the foraging bees that not-by-accident communicates where to find flowering trees and plants that have the special nectar and honey potential the bees need for survival. Once they've learned all the signals, out they go with their bright fuzzy hair, plunging into the spring flowers for the wonderful nectar that awaits their visit as they pollinate those same plants. Now the Creator gave some extra special equipment to those field bees who head out foraging. Not by accident there is a flat area on the hind legs of these bees where their Designer has placed little pollen baskets. The honeybee drinks deeply of the flower's gift to her. And some of the pollen from one flower is rubbed off on the next. But not all is rubbed off. So the little bee will stop from time to time and scrape the pollen left on its hairs into the little pollen baskets on its hind legs. Then it continues visiting more flowers. Finally the pollen basket is too full to continue foraging, and the field bee returns to the hive where the home bee removes the pollen from the basket and places the pollen in pantry cells to be used for storage of that pollen protein nourishment the bees themselves need. Meanwhile, not by accident, the Creator gave the field bees an extra stomach, in which they store or transport honey or nectar! When the time is right, the little field bee passes the contents of that second storage abdomen from her mouth to the mouth of the home bee—who places one drop of honey in each waiting cell. "Honeybee AC" is turned on then as other home bees begin circulating air with their wings over that one drop until all water evaporates. The system works. The design is flawless. The Designer and Judge of all the earth does things right!